I’ve been measuring a bunch about my life for around a year now. People often ask me how to get started and what to buy. These are my recommendations. You’re probably measuring your life because you want to change something. As a first step toward change I recommend using 42 Goals. Set up a very simple boolean (yes or no) goal like “opened a book,” “went for a walk” or “went to sleep by 11 pm”. If the goal is successful for a day make sure you give yourself a positive reward image — my favorite is the picture of the hamburger. If the goal doesn’t work out don’t give yourself a negative checkmark — just move on. Don’t punish yourself for missing the goal and treat each day as a new one. Along with your first goal I also recommend setting a meta-goal of “Checked into 42 Goals.” Stick that in your calendar or as a reminder on your phone for a few weeks to make sure you’re doing checking in every day. Once the habit starts you can layer all kinds of minor positive lifestyle modifications into the system. I try to check into 42goals every morning and review the previous day. Right now I’ve got 19 “goals” but all of them are just minor behavior modifications, and only a few of them do I really make sure I hit daily. Credit for using 42Goals solely goes to my friend Will Benjamin who helped me set all of this up back in 2011. It’s become an amazing part of my life. You might start with the Fitbit Aria scale. It’s cheaper than the Withings scale and it probably syncs with other Fitbit data. There are a bunch of devices for measuring exercise but the only ones I’ve owned are the Jawbone UP and the Fitbit Ultra (no longer sold, the best current product is the Fitbit Force which is delayed 2-4 weeks for shipping. The Fitbit Flex is almost the same thing but without a clock.). The UP is great for tracking sleep and exercise and has a nice app, but not many people have the device and it lacks a website. It’s also frustrating that the UP is a computer I wear on my wrist that lacks a clock. The Fitbit Ultra is my favorite of the two. I just leave it in my pocket all week, it syncs wirelessly to my computer, and the battery rarely needs to be charged. Mine has even been through the clothes washer and survived. 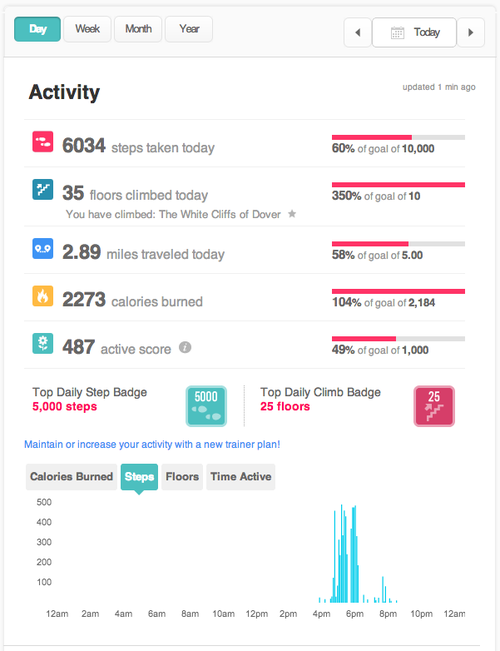 Fitbit is building a pretty large social network around exercise. Living in San Francisco makes me an outlier but I have 15 friends on their network and it’s cool to compare step counts. Fitbit seems to have nailed the gamification of exercise and is now sending me push notifications when I hit or am close to my goals. For 2012 my average daily steps were just slightly over my goal of 10,000 — this tells me Fitbit is doing a great job keeping me exercising. If I had to buy one device today I think it would be the Fitbit Flex. It looks like the Flex combines the best aspects of the UP and the pocketable Fitbit (frustratingly it also lacks a clock…). The Flex is available for preorder. Tracking sleep is new for me and I’ve only been doing it since December. My best recommendation is the app Sleep Cycle. You just slip the phone under your pillow and it wakes you up within a specified 30 minute time range in the morning. For me this means running an extension cord from the wall to my bed with a small iPhone charger next to me at night. Once nice feature is you can program in questions about your day that get asked every day before bed. Mine include whether I ate late, took Melatonin, went for a walk, went to the gym, drank coffee, drank Red Bull, meditated before bed, or had a “stressful day”. Sleep Cycle’s statistics page gives basic time series of total time slept, time to bed, and the impact of different sleep notes on sleep quality. I found a few months ago that drinking Red Bull destroyed any chance I had of getting a good night’s sleep and propagated tiredness into the next day — so I largely cut it out of my diet. Things that help me sleep are going to the gym, eating late, and meditating before bed. Another thing Sleep Cycle can do is ask your mood every morning. This data is not super actionable yet. Sleep Cycle lets you export to CSV and I’ve found no relationship between my time in bed or my “sleep quality” and my mood in the morning. 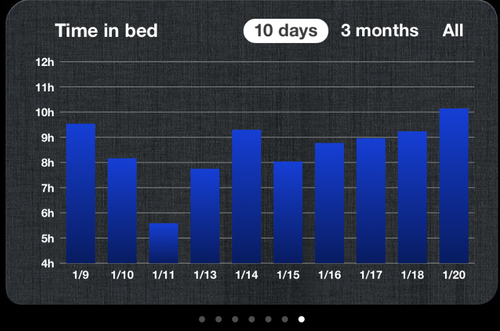 Ironically I think I sleep better on nights when I’m not tracking my sleep. I’ll have to dig into this more later. This is bonus points. 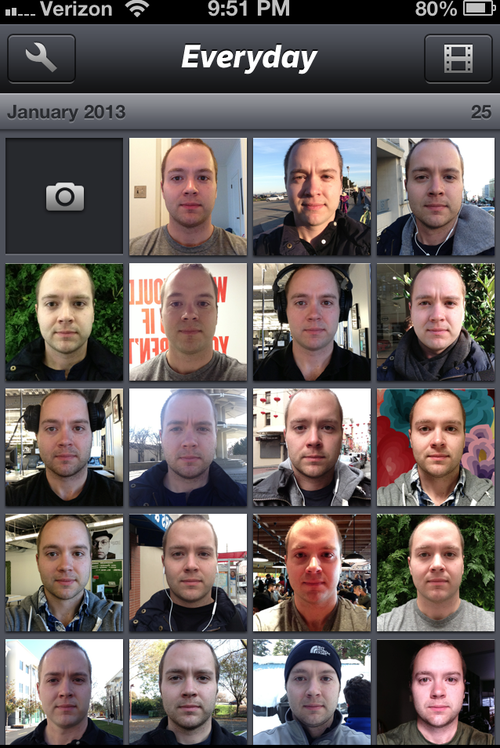 I use the app EveryDay to take a daily snapshot of my face. This was really cool in early 2012 when I lost a bunch of weight and could see my face melt away in the exported video. More recently it just shows me what clothes I wear habitually (I was once prone to wear the same shirt every Thursday). Tying these systems together: I’ve had a goal in 42 goals since last March to take my EveryDay picture. A bunch of my friends are using One Second Everyday to create videos of their lives. I haven’t gotten into the habit of taking a daily video. I do a lot of this measurement and have more planned. Mostly I find the historical aspects of the data most interesting, they help me remember the story of my life. My data acts like a black box and makes it easier to remember what night I stayed out late, what day I took a long walk, and what day I did nothing. The data lets me put my life and goals in context and figure out which ones I’m progressing on and which ones are stalling. Honestly the crux of the whole system is 42Goals. 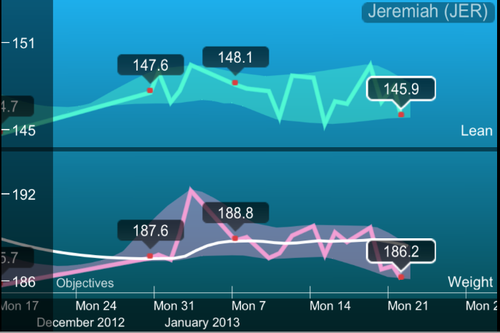 It keeps me accountable for minor healthy habits (meditation, eating salads, going to the gym, opening OmniFocus). Without this anchor of binary goal tracking most of the other stuff would fall apart.